Do you want to build a more stable system that’s able to cope with individual node crashes? Join Manuel Bernhardt in this tutorial as he shows us techniques for making a reactive payment processor resilient to failure using Akka Cluster. 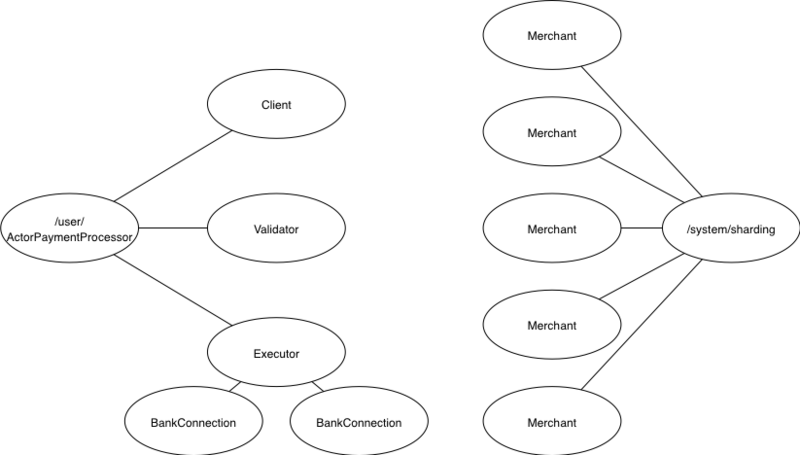 In A tour of Akka Cluster – Akka distributed data we looked into building a reactive payment processing system using Akka Distributed Data as a means to provide master-master replication to the order storage component. We did not, however, ensure in any way or form that the system as a whole could withstand individual node crashes. In this article, we will explore options for making the Reactive Payment Processor fault-tolerant. Let’s make a thought experiment and see if our current design is fit to be “upgraded” in the light of redundancy. Let’s suppose we have made the validation process redundant so that it would take place on any node (not just the node on which the order was first registered). This way, should the order receiving the node fail, we would still be able to continue validation and processing (so long as it wasn’t the node also handling the particular acquiring bank). If we would like our system to work, then, it would need to fully embrace the eventually consistent nature of the OrderStatus CRDT. What this means in practice is that each actor that relies on status change notifications needs to have the ability to “course correct” if it receives new, possibly conflicting, instructions. Or in other words, it is not enough for the OrderStoragecomponent to be eventually consistent – the moment we embrace eventual consistency, our entire downstream system needs to be eventually consistent as well. Eventual consistency is a property of the entire system, not of a single component. It is unlikely that a client system would handle this type of rollback scenario very well, nor would we want it to have to handle it – it would not be the best for the credibility of our payment processing gateway. If we are to continue down this path, we will need to issue compensating transactions to the acquiring bank system. Additionally, though, we will need to take care of tracking whether we have gotten ourselves in such a situation in the affected actors and make sure we do not forget about it in case of a crash. All in all, this might not be a very clean solution to put into place. 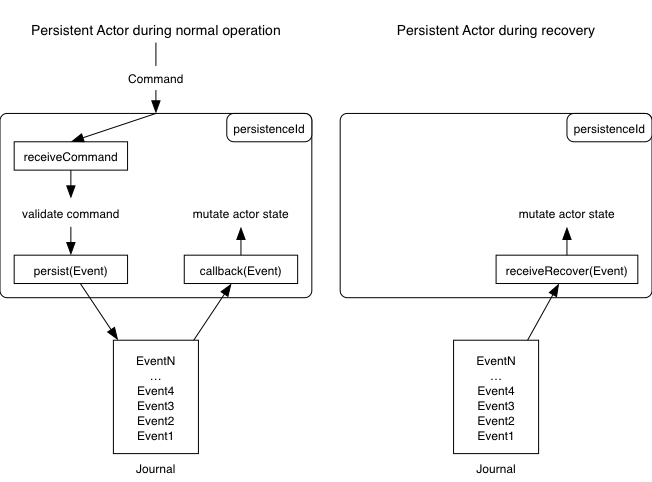 When an event is persisted successfully in the event journal, a callback handler is called for the event and then reacts, such as by changing the state of the persistent actor. This way you’re ensured that only events that have been written to the journal have any impact on the state of an actor. Note how the events need not carry the entire breadth of attributes over every time. The initial order data is captured in OrderCreated (by re-using the StoredOrder from the OrderStorageactor that we no longer use). Changes in order status or additional attributes (such as the bankIdentifier) are captured through lightweight events. In receiveRecover, we handle the recovery from a crash by updating our internal state. Note how we do not populate orderClients (there is no sender in this context!) and how we do not trigger validation again. Persistent actors offer a robust mechanism for saving state. 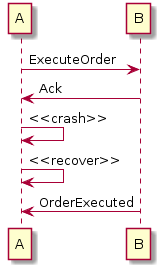 Instead of saving the data itself (as in a traditional database or key-value store) we instead save a sequence of events which we then replay in sequence to rebuild our state during recovery. There are quite a few things that we haven’t considered here and I do encourage you to check out the Akka documentation on persistent actors. You’ll want especially to familiarize yourselves with snapshots as a mechanism to speed-up recovery, choose a storage plugin and most importantly pick a serialization format(whatever you do, do not use Java serialization which is activated by default). If you remember the previous article, the Executor for a specific acquiring bank is not necessarily co-located on the same node as the node receiving and processing an order. Previously we relied on Akka Distributed Data to distribute orders across nodes and let the nodes pick the orders that were relevant for them, based on the knowledge that they were in charge of the execution for one particular acquiring bank. With our new design, we are now in charge of sending the order for execution to the correct node.